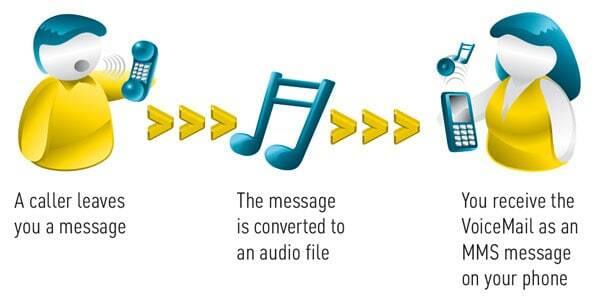 Voice to MMS sends you an audio file of the spoken message straight to your MMS compatible mobile handset. This way, you are just one-click away from listening to your voice messages! There is no need to dial in to your voice mail box again and means you can access your messages more quickly and also sort, forward, delete and reply to your messages directly from your mobile message inbox. Voicemails will be sent as an audio MMS file to your mobile handset. All you need is an MMS compatible handset. With all your voice messages sent to your handset, you never need to dial into 321 again. Enjoy unlimited voicemails received within Australia converted to MMS for only $4.99 per month. Roaming charges apply to receive MMS when overseas. This is a month-to-month service without any long-term commitments. Optus Post-Paid customers can try this service for free for 30 days if they have not activated Voice to MMS on their current service before. Please call 369 (free of charge) from your mobile for information on this service. Voice to MMS is not available to Pre-Paid customers. *You must have an active Optus mobile account with VoiceMail active, you cannot get Optus Voice to MMS if you have call barring activated or are using SurePage or Voice to Text. Please call 133937 for assistance.